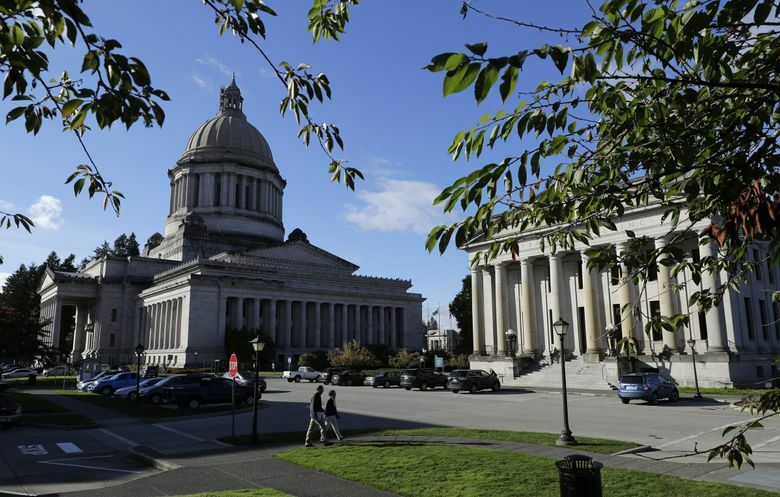 OLYMPIA — A trio of Washington Legislature races appear to be headed for recounts, including a hard-fought race for an open state Senate seat that has flipped back and forth since the Nov. 6 elections. These remaining close races will determine the margin by which Democrats will control both the House and the Senate. If the results as of Friday afternoon ultimately hold, Democrats would gain a total of three Senate seats and seven House seats. That would give them a 28-21 edge in the Senate and a 57-41 margin in the House. Right now, perhaps the most closely watched contest is the 26th District state Senate seat left vacant by the retirement of Sen. Jan Angel, R-Port Orchard. In that district, which includes parts of Kitsap and Pierce counties, Democrat Emily Randall took the lead in early results, before Republican Marty McClendon, who ran unsuccessfully for lieutenant governor in 2016, took the lead. But the candidates have once again switched places in the race. On Friday afternoon, Randall, a community organizer, led by 90 votes, a difference of 0.12 percentage points. “I was prepared for a close race, but I’m not sure I was prepared for this kind of intensity,” said Randall. She compared her race to other close elections across the country this November where Democrats ultimately prevailed. Counties must certify election results by Nov. 27, after which the Secretary of State’s Office would direct a recount for races that qualify. Mike Rooney, elections manager for the Pierce County Auditor’s Office, said any recount for the 26th District race would likely take place in the first week of December. In Whatcom County’s 42nd District, Sen. Doug Ericksen, R-Ferndale, has held a slender lead over his Democratic challenger Pinky Vargas. In a race that pitted Vargas, a Bellingham City Council member, against one of the Legislature’s most ardent supporters of President Donald Trump, Ericksen led by 58 votes, or 0.08 percentage points, on Friday. Meanwhile, in a 42nd District House race, Republican Rep. Luanne Van Werven of Lynden was leading Democratic challenger Justin Boneau by 95 votes, or 0.14 percentage points. “We’re hanging in there,” Van Werven said. Under Washington law, a recount is necessary when the vote margin between the two candidates is both less than 2,000 votes and less than 0.5 percent of the total number of votes cast for those candidates. When the margin between those two candidates is both less than 150 votes and less than 0.25 percent of the total votes for those candidates, a manual recount is required. Since 2007, only three elections for government positions have had their results reversed by a recount, according to the state Secretary of State’s Office. None of them were state legislative races. In three other instances since then, races for party precinct committee officer flipped after recounts.